The Southeast Comedy & Cabaret nestled on the 2nd floor of The Brewster Ice Arena Complex, away from the ice, will have to postpone tonight’s show Jan 19, 2019 due to the…Pending Ice Storm. (I’ll take irony for 200, Alex) Stay tuned for a new date. In the meantime we want all of our customers to stay safe. January 19 is going to be a great night at The Southeast Comedy & Cabaret. 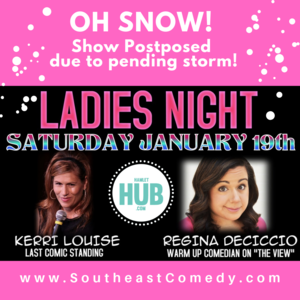 Kerri Louise & Regina Deciccio will be bringing the funny. It is a great opportunity for a Girls Night Out. We are located on the 2nd floor of The Brewster Ice Arena. If you are (or know) someone who spends most of their time in "manic mode" while in our building, this will be a real treat. 90 minutes of food, drink and laughs with friends and no distractions is good for the soul. You can check out this quick sample of Kerri & Regina. Enjoy some pre or post (or both) show drinks & food at Players Restaurant. There will also be full bar service & food available in the showroom during the show.